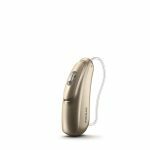 Marvel hearing aids are the latest range of receiver in the canal hearing aids released by Phonak. 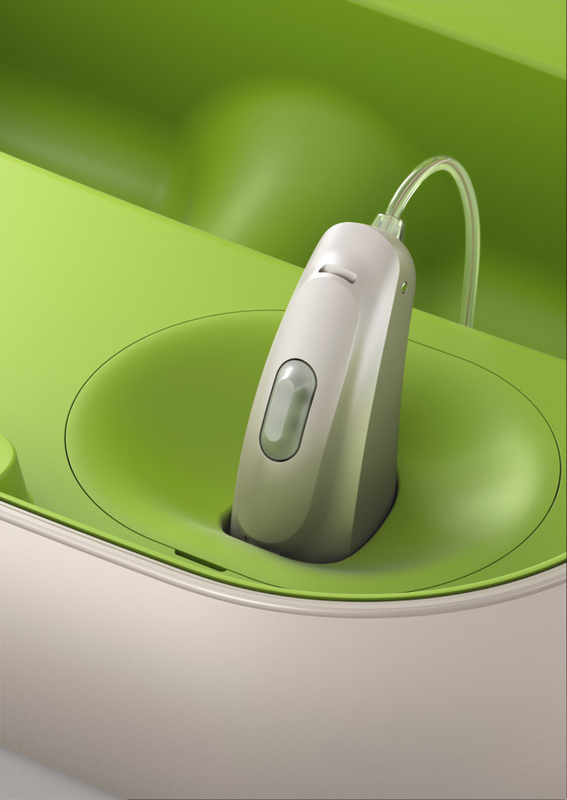 Phonak Marvel brings a some key innovations. The speaker system has remained unchanged for a number of hearing aid generations, however for Marvel it has been completely redesigned. When combined with the new sound processor the Marvel aids offer a rich clear sound designed to reduce listening effort. The AutosenseOS 3 sound processor allows the Marvel aids to adapt more precisely to suit the environment they are in. Marvel adapts to the listening environment. Bluetooth connectivity is standard across the Marvel range this allows direct connection to mobile phones, televisions and other devices such as music players and tablets. Assistive devices such as remote microphones like RogerDirect can connect directly to significantly improve listening in noisy situations such as restaurants. Phonak Marvel is available now at CMD Hearing Care, please contact us if you would like to make an appointment or have any questions. Following the recent launch of the new Moxi Now hearing aids from Unitron I received my first pair for fitting next week. when I opened the box I was truly shocked at how small they are. The Moxi Now aids are fraction of the size of Unitron’s existing Moxi Kiss aid, yet still packs all the same features. This image shows the dramatic size reduction of the Moxi Now, whist still retaining the wireless functionality of the larger aid. 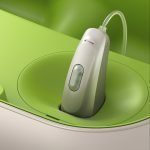 Phonak have launched their latest line up of hearing aids which for the first time include a rechargeable option. The Audeo Belong range of hearing instruments are based on a new operating system; Autosense OS allows the hearing aid to automatically adapt to their surroundings and by blending between different features they are able to select up to 200 different sound settings. 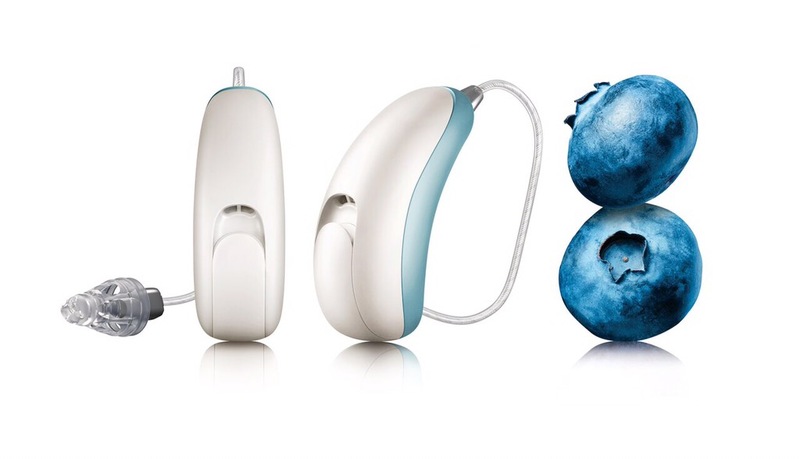 The rechargeable Audeo-B-R hearing instrument is the longest lasting rechargeable hearing aid ever and offers up to 24hours use after just 3hours charge. If you would like to make an appointment or discuss your hearing needs please do not hesitate to contact me. Many modern hearing aids feature wireless technology. Wireless communication allows sound to be transferred into the hearing aids directly from sound sources such as mobile phones, tablets or televisions. Although for many people such features would not be beneficial as they do not use such devices, or they do not want the complexity of introducing additional wireless devices. There are however wireless features that are less obvious that all hearing aid wearers can find beneficial. Binaural spatial processing sounds complicated, however simply put it is the ability of a pair of hearing aids to work together to help pick out voices in noisy or group situations. A simple example might be a noisy restaurant, when somebody starts talking on the hearing aid wearer’s right their right hearing aid detects this and tells the left hearing aid to reduce its sensitivity, therefore helping to emphasise the voice above the background noise. 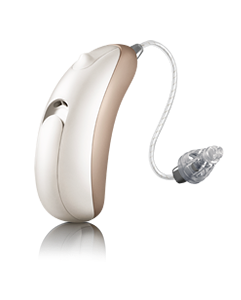 An example of this technology is SpeechZone 2 which is featured in the current range of Unitron hearing aids. 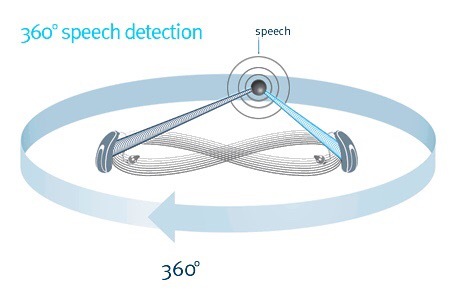 SpeechZone 2 automatically adjusts the sensitivity of the microphones on the hearing aids to track speech in any direction around the hearing aid wearer. When using the telephone sound will be transferred into both ears simultaneously. Binaural phone enhances the clarity of telephone conversations and provides balanced conversations. Wireless technology in hearing aids can be beneficial for all people. If you would like more information, or would like to make an appointment please do not hesitate to contact me. Unitron have announced their latest product the Moxi Now. The Moxi Now is the smallest wireless receiver in the canal hearing aid in the world. The Moxi Now is fully featured and includes technology such as SoundNav so the hearing aids automatically adjust to suit their environment. The inbuilt wireless technology allows the aids to communicate with one another to improve their performance in noisy situations. The Moxi Now will be available in October this year. If you would like to make an appointment or need any further information please do not hesitate to contact me. FlexTrial from Unitron is an amazing piece of technology now available at CMD Hearingcare in Leeds and Yarm areas. The system allows people with hearing loss to experience wearing hearing aids before making the decision to purchase. Hearing aids are available in many different configurations, it is important to match the features and technology within the hearing aids to the lifestyle of the person who will be wearing them. Through a discussion of your lifestyle we would aim to find a hearing aid that matches your needs. Now however, the FlexTrial system gives us a much more precise and individualised method of finding the right match for your hearing needs. 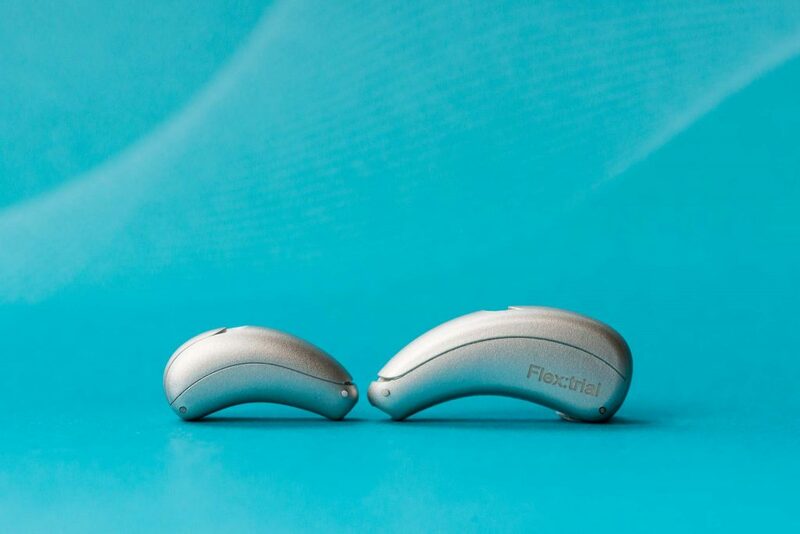 When using the FlexTrial system the wearer is able to hear how the hearing aids sound and see the benefit they get, in addition the devices gather information about the sort of situations the wearer finds themselves in and the features and technology that would be beneficial. Following the trial period we can review the information stored in the hearing aids and therefore make an informed choice regarding the type of aids that would be most beneficial. The FlexTrial is a fantastic opportunity to take the guess work out of getting hearing aids for the first time. They allow you to experience using hearing aids and then make a truly individualised and informed choice about what will be beneficial for you. Unitron has created a great video that shows the FlexTrial system in action and their benefits. If you would like to discuss your hearing requirements or experience FlexTrial please do not hesitate to contact me. FlexTrial is a wonderful innovation from Unitron that helps me and my client find the perfect hearing aid for them. A recent client proved a perfect example of how the technology can help to match a hearing instrument to the lifestyle of the wearer. My client in this example works in a school and as a result encounters a number of different listening situations such as in the classroom, with children in small groups, as well as quiet conversations at work and home. 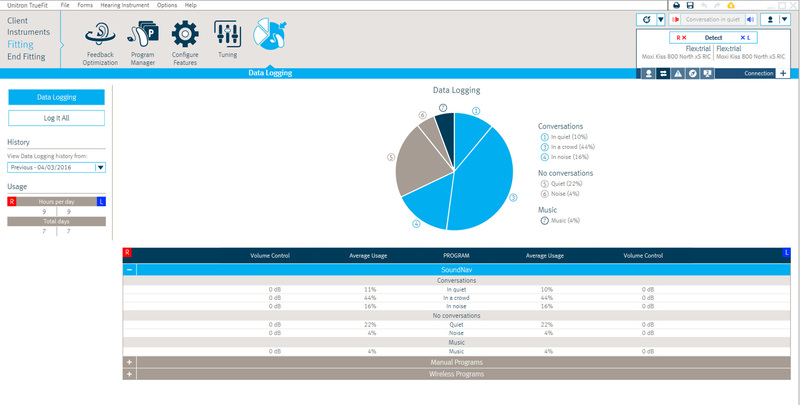 After two weeks of use the hearing aids recorded the different situations that the wearer found themselves in, software can be used to show the settings that the hearing aids applied and as a result what specification of hearing aid would be most beneficial. In this example my client works as a teacher in a school, the hearing aids recorded that the wearer found themselves mainly in small groups and in noisy situations. The situations the hearing aids identified accurately reflected the situations the client found themselves in at work. Based on the information gathered the client could see the effect of choosing different types of hearing aid and make an informed choice regarding the aid that best matches their lifestyle. 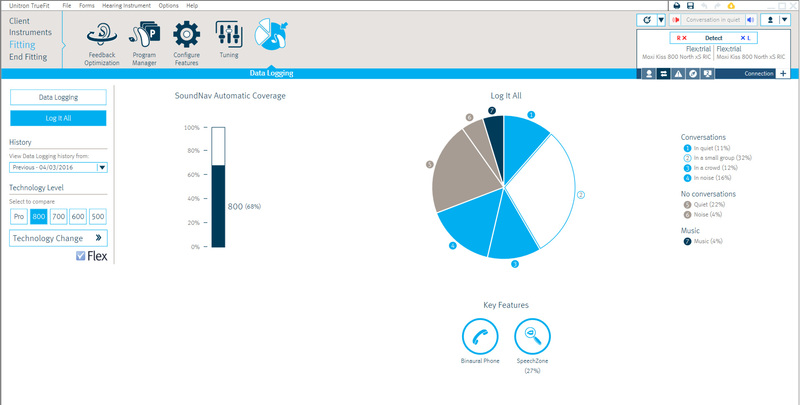 FlexTrial is an excellent tool that is extremely useful in helping clients find the ideal hearing aid for them and take the uncertainty around matching it to their requirements. 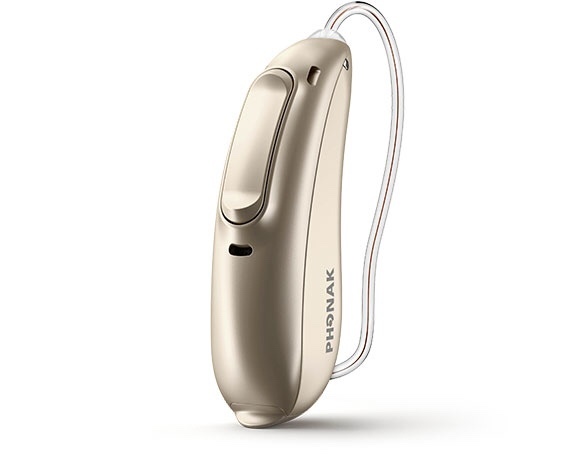 The latest Phonak hearing aids allow the transfer of settings easily between different hearing aids even if they are different models – excellent for clients replacing lost hearing aids and extremely useful in busy NHS clinics! When considering buying a hearing aid it can be very difficult to decide which specification of hearing aid would suit you the best. Privately purchased hearing aids are available in a variety of different specifications at different price points. The aim is to match the level of sophistication and specification of the aid to the lifestyle of the person wearing it. Flex Trial is a fabulous piece of technology from Unitron that can help find the ideal hearing aid solution. Temporary hearing aids are programmed to match your hearing; you then wear them in your day-to-day life. The computer within the hearing aids analyse the situations you find yourself in and then make recommendations to help find the perfect, tailor made solution for your lifestyle and hearing requirements. Contact me if you would like to make an appointment or discuss your hearing needs. Rechargeable hearing aids offer a convenient solution and will last all day on a single charge. Phonak B-Titanium hearing aids offer the most discrete and smallest hearing instrument. Bluetooth connections allow hearing aids to link directly to other devices such as mobile phones.